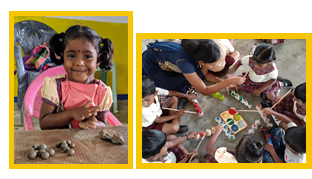 The Sunshine Charity was founded in the aftermath of the December 2004 tsunami primarily to take care of children affected by the devastation through the establishment of a day care centre in Sambalthivu, Trincomalee District, Eastern Province, Sri Lanka. Today, the Sunshine Day Care Centre, it is one of the Charity’s projects. Children attending the day care centre, include orphaned and vulnerable children and those affected by poverty. With generous funding received from local philanthropists and international donors, the centre has provided the children with not only their basic needs like nutritional food and clothing but more importantly with creative opportunities, medical care and learning skills as well as educational tools. Through its programmes, the organization seeks to strengthen the capacity and improve the lives of the children served. The Centre is managed by the Charity’s five Trustees who are directly involved in the operational work and is able to implement its programmes with the support of the community and local partners. The Sunshine Charity is a charitable, not-for-profit organization, registered in Sri Lanka by a Trust Deed.